Summer gives you permission to slow down and stop trying so hard. Resign yourself to time on the patio with friends, reading for pleasure, and easy meals. We share several simple and tasty taco recipes which require minimal effort and time, leaving more time to relax. 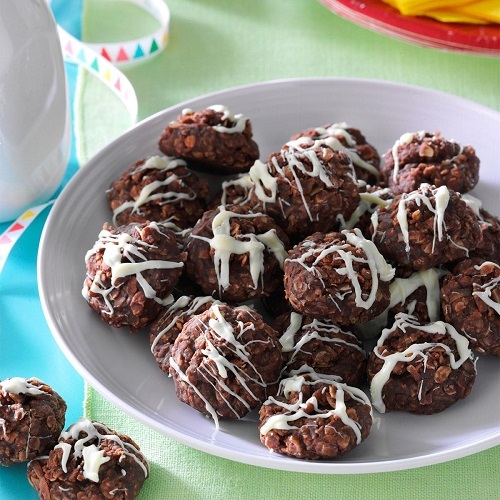 To round out your simple meal we’ve included a recipe for Watermelon Salad and No Bake Coconut Cookies. Favorite easy summer time meal shared by team member Mitzi Monson. 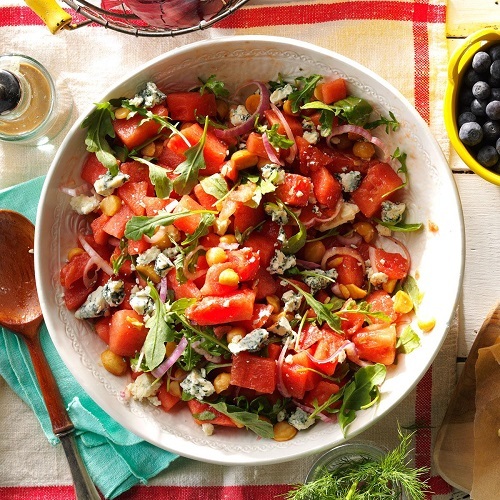 Making the salad ahead allows for a quick dinner on a busy summer night. Toss the ingredients minus the feta and cucumber dill dip together for the salad. If you cannot find the dip ready made you can mix together dill weed, plain greek yogurt and little hint of salt for a similar dip. If you’ve never tried a refrigerated tortilla cooked before you are missing out. All you do is heat them up in a skillet for about a minute on each side and they are unbelievable good and light. Simple and life changing. Puree first nine ingredients in a blender; stir in beer. In a 5- or 6-qt. slow cooker, combine pork and pineapple mixture. Cook, covered, on low until pork is very tender, 6-8 hours. Stir to break up pork. Stir cilantro into salsa. 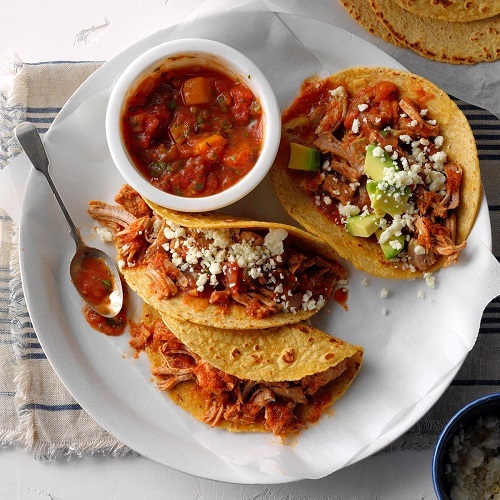 Using a slotted spoon, serve pork mixture in tortillas; add salsa and toppings as desired. Freeze option: Freeze cooled meat mixture and cooking juices in freezer containers. To use, partially thaw in refrigerator overnight. Heat through in a saucepan, stirring occasionally. Yield: 12 servings. 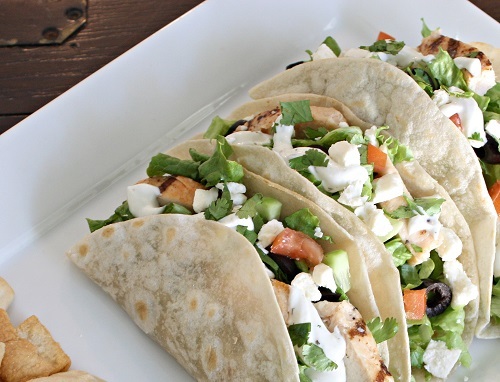 Light and healthy tacos. Try adding tomatoes, green onions and chopped jalapeno’s on top. In a small bowl, toss coleslaw mix with oil and lime juice; refrigerate until serving. In another bowl, mash avocado with a fork; stir in sour cream, onion, cilantro, salt and pepper. Sprinkle tilapia with salt and pepper. In a large nonstick skillet coated with cooking spray, heat oil over medium-high heat. Add tilapia; cook until fish just begins to flake easily with a fork, 3-4 minutes on each side. 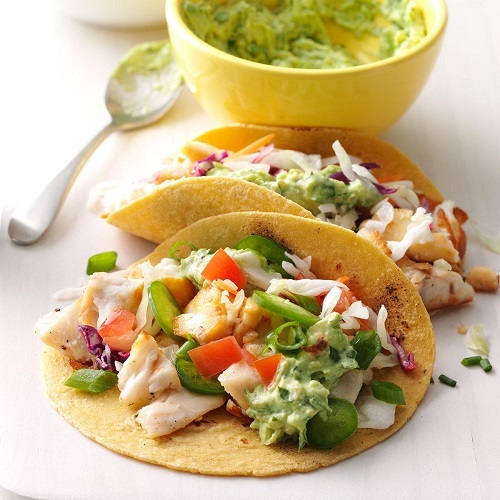 Serve in tortillas with coleslaw, guacamole and desired toppings. This salad offers a surprising mix of flavors. Combine seedless watermelon varieties in yellow, red and pink for a colorful twist. In a large bowl, combine watermelon and onion; cover and refrigerate until cold, about 30 minutes. Just before serving, add macadamia nuts and arugula to watermelon mixture. In a small bowl, whisk vinaigrette and oil; drizzle over salad and toss to coat. Serve over sliced watermelon, if desired. Sprinkle with cheese. Easy to make and no need to heat up the oven! This is a summer favorite of team member Mitzi Monson. In a microwave, melt baking chips and shortening; stir until smooth. Drizzle over cookies. Refrigerate until set. Store in airtight container. Best if stored chilled.